Veronica Beard "Serena" multi-print dress. V neckline; wrap front ties at side. EXCLUSIVELY AT NEIMAN MARCUS Aidan by Aidan Mattox wrap dress in striped sequins. Approx. 38"L down center back. V neckline and back. Sleeveless; spaghetti straps. Contrast sash at waist. Sheath silhouette. Midi length. Polyester self/lining. Dry clean. Imported. Alice + Olivia "Adele" cocktail dress in floral-print with lace trim. V neckline; wrap front fastens at waist. Short flutter sleeves. Draped skirt. High-low hem. Midi length. Viscose/silk; nylon combo. Polyester/spandex lining. Imported. Model's measurements: Height 5'10"/177cm, bust 33"/84cm, waist 25.6"/65.2cm, hips 35.8"/91cm, dress size US 2-4/FR 34-36. 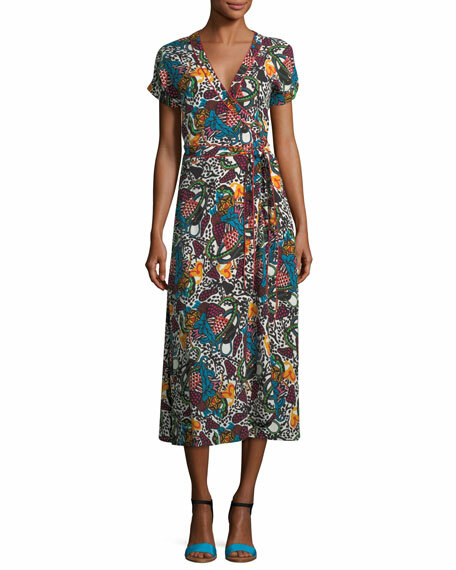 Etro dress in bi-color floral print textured jersey. V neckline. Long sleeves. Twisted front. A-line silhouette. Maxi length. Back zip. 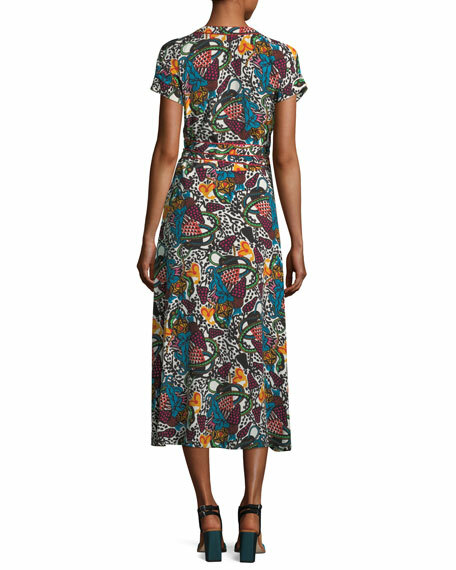 Etro dress in bi-color floral print textured jersey. V neckline. Long sleeves. Twisted front. A-line silhouette. Maxi length. Back zip. Polyester/spandex. Made in Italy. Model's measurements: Height 5'11"/180cm, bust 32"/81cm, waist 24"/61cm, hips 35"/89cm, dress size US 2. Herve Leger gown in metallic bandage knit with allover fringe trim. Deep V neckline. Wide straps crisscross at back. Banded waist. Midi length. Back zip. Rayon/nylon/spandex. Imported.